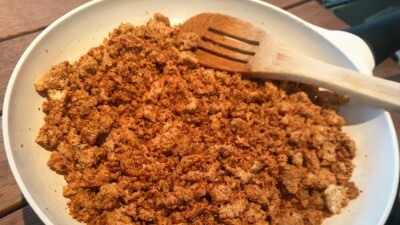 This Tofu Chorizo is a super tasty vegan ground meat substitute that is perfect to use in tacos, burritos, lasagna, or even tossed through a salad or on a baked potato. The options are endless! Crumble tofu into a non-stick fry pan (do not put heat on yet). Add all remaining ingredients to the pan. Turn heat to medium high and stir for 5 to 10 minutes until the texture is to your preferred consistency. You can leave it as soft or make it as crispy as you like.